The best teeth are your own natural teeth. But sometimes, a tooth is badly damaged or lost. If a tooth is lost, it is important to replace it with an artificial tooth as soon as possible. This will prevent the teeth that are left from drifting out of line and possibly causing jaw problems. Teeth that are out of line are harder to clean and are more likely to get periodontal disease (gum disease) and cavities. If one or more of your teeth are missing, your dentist in Brampton Kennedy Square Dental may suggest replacing your missing teeth with a bridge or a denture. A bridge, also called a “fixed bridge” is a dental restoration that replaces one or more missing teeth. It extends across an area that has no teeth and is typically made up of an artificial tooth fused between 2 crowns. (A crown is a hollow, artificial tooth that fits over a natural tooth or a dental implant). The bridge is held firmly in place by your own teeth on each side of the missing one(s) or by dental implants. A bridge is permanent and cannot be removed. Dentures are artificial replacements for your natural teeth and gums. There are 2 types of dentures: partial and complete. 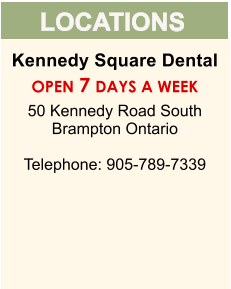 For both types of dentures your dentist in Brampton Kennedy Square Dental makes a model of your teeth by taking impressions. The models are used to custom-make your dentures.